An authority on all things animation, although too modest to make that claim herself, Box Hill graduate Annie Duncan is now using television to encourage budding animators of all ages. Something of a renaissance woman, Annie’s eventful life has traversed a number of paths. She completed a Bachelor of Education in Media and Drama at Victoria College in 1983, has directed a number of 16mm animated films which were shown at a selection of festivals, organised and exhibited art shows, taught Film, Video Production, English and Drama, ran an animation studio, worked in lightning and stage management for the theatre, music and film industry, and has owned an essential oils business, designing products and supplying shops nationwide – amongst other things! 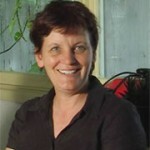 In 2005 she returned to academia to get up to date with the latest technological developments and learn how to harness computers for animation purposes. Studying an Advanced Diploma of Multimedia at Box Hill, one of her strongest memories of the Institute was walking through the doors on her first day and seeing how young the rest of the class was. However, by the time she had graduated three years late she had become firm friends with her peers. As one of her class said to her: “You are as old as my mother and yet you are our best friend”. Upon graduating from Box Hill, Annie and some of her classmates have been writing, directing, and presenting a 13 episode TV series for Channel 31, titled ‘The Animators Club’. The 13th and final episode aired in June 2010, and they are currently looking to get funding for a second series. The Animator’s Club is a community of people, connected by a passion for animation. On each episode, Annie and her associates explore every aspect of animation, sharing tricks, ideas and work, and inviting viewers to either send in their own creations, or just sit back, relax and watch. “The show is about the creative process of animation, but done in a fun way. It’s divided into sections, covering the different aspects of animation, so it’s instructional in a sense, but it can also just be viewed and enjoyed as entertainment… whilst exposing audiences to more innovative forms of animation,” said Annie. Annie wrote the script for the show, then met with her classmates for some brainstorming sessions at La Porchetta. Once finalised, they approached Channel 31 with the script, and the rest is history. Whilst Annie was the most experienced animator in the group, she says that it was very much a collaborative effort, and that they all “filled in each other’s knowledge gaps”. For Annie, the assistance of some younger, more computer-savvy colleagues was a big help, and together they often worked till four or five in the morning to get the show onto the screen.